Rudolph J. Pierich, 86, of Lower Paxton Twp., passed away Thursday, July 8, 2004 at Harrisburg Hospital. He was born April 17, 1918 in Enola, son of the the late Paul and Mary Grubic Pierich. He was a self-employed general contractor for many years. He was a paratrooper with the Army Air Corps 82nd Airborne in World War II, serving at Normandy on D-Day. He was a member of Holy Name of Jesus Catholic Church and a past American Legion member. He was also a former volunteer for the Boy Scouts of America. He enjoyed woodcrafting, model trains, hunting and fishing. He is survived by his wife, A. Margaret Pierich; 3 sons, Michael of Halifax, Kenneth of Mechanicsburg and Steve of Colorado Springs, CO; 2 daughters, Catherine Alarie of Harrisburg and Mary Ann Vigilante of Carlisle; 1 sister, Frances Arnick of Annville and 9 grandchildren. A Mass of Christian Burial will be held on Monday morning at 11 a.m., at Holy Name of Jesus Catholic Church. The viewing will be held on Monday morning from 10-11 a.m. at the church. Interment will be at Resurrection Cemetery. Arrangements by Hoover Funeral Home & Crematory, Inc. 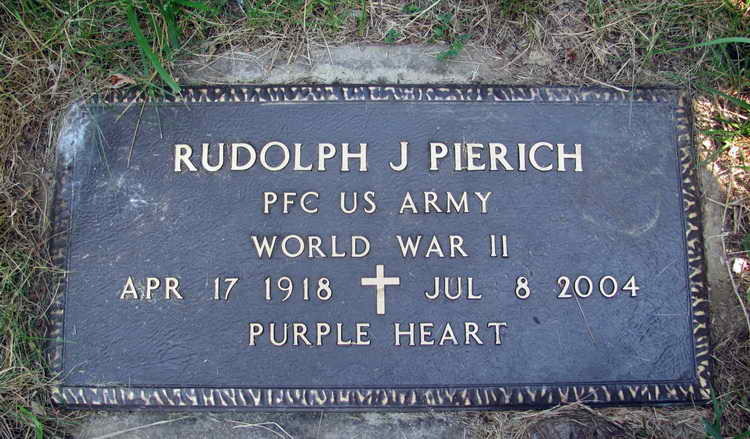 Grave marker for Rudolph J. Pierich in the Resurrection Cemetery Harrisburg (Dauphin county), Pennsylvania. Rudolph enlisted in the Army at Harrisburg, PA on 7 July 1942. He served with the Headquarters Company, 2nd Battalion. He jumped into Normandy on D-Day, 6 June 1944 and was reported MIA that same day. Pfc Pierich was held as a Prisoner of War until 7 September 1944 when he was liberated from the Rennes Military Hospital in Rennes, France and returned to duty.